The nascent on-demand economy is growing with hundreds of new platforms that have inspired new thinking and practices. Attention is being paid to how these companies are disrupting commerce, solving logistic problems, and creating a new sector of the labor force—and a new era of entrepreneurs. Today, the number of small business is growing exponentially—and it’s not because typical small businesses are opening more doors. It’s because of the growing numbers of self-employed. The concern is that while these trends may be good for some, they could result in a race to the bottom for entrepreneurs in lower/moderate income sectors. The challenge is to help this population manage their multiple income streams so that they can survive and thrive and achieve viable incomes—and ultimately create wealth. This invite only event will be a day of exciting exploration with stakeholders from business, government, policy and research organizations, business service providers and of course, the entrepreneurs. Explore the data, trends, and opportunities with new research by the Federal Reserve Board, Intuit and Emergent Research with an eye toward the impact on low-moderate income individuals. Real people are behind the data. Meet them through a moderated panel of entrepreneurs that asks what does the new era workforce look like, what challenges do self-employed entrepreneurs face that prevent them from thriving, and what do they need. The panel will be followed by a discussion. 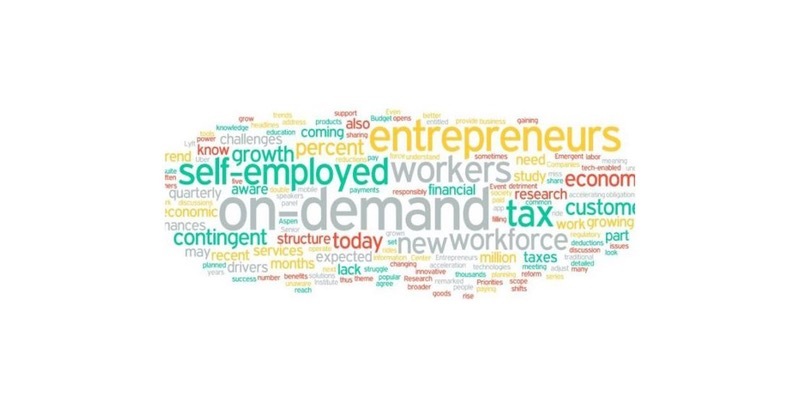 The Entrepreneurial Ecosystem: Coaching, Capital, Connection to Markets, Climate – What are some of the solutions being implemented right now to create opportunity for all? What are some of the solutions of the future? What can we imagine? Brainstorm in break out groups and report back and continue to discuss.